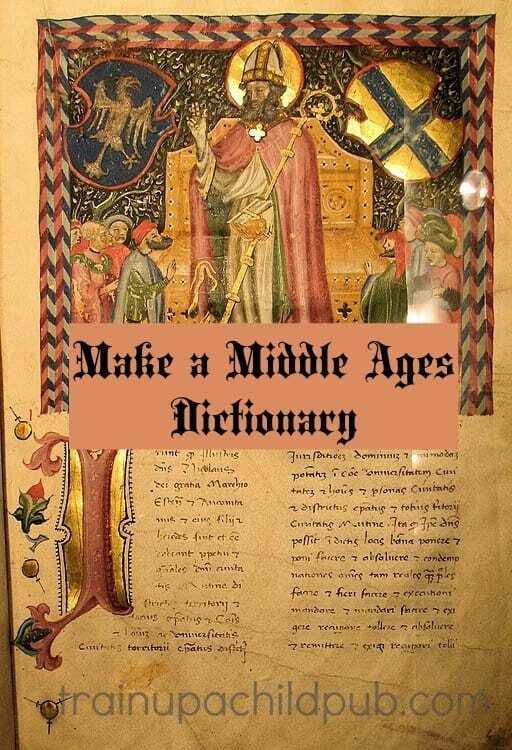 This make a Middle Ages Dictionary project is taken from our Middle School Lesson Plans. The student finds middle ages vocabulary while reading Adam of the Road. Although you could use this lesson plan to fit another period, book, topic, or age group. Learning a subject’s vocabulary is an essential part of learning about any subject. Having your student find his own vocabulary words and do the research on their meanings will increase his/her understanding of the Middle Ages. And this principle can be applied to many other time periods or topics as well. There are many terms in Adam of the Road that relate to items or activities specific to the Middle Ages. Each time your student discovers a medieval term in his reading or vocabulary word lists, have him include it in his dictionary. You might challenge him to find as many words as possible and offer a small incentive if he reaches a certain number of words. If you are teaching more than one student of similar ages/abilities, you might even have a contest for the most words included. Many of the time-specific words encountered in Adam of the Road and other Middle Ages reading can be found in a regular dictionary, but some of them require a little more research. An online encyclopedia or the following links to online medieval glossaries may be helpful. Note that we have not checked out every word in these glossaries and we always advise you to supervise your students on the Internet! Your student may use lined or unlined paper for this project, or, if he can type, he may key in his words and definitions into a spreadsheet program where they then could easily be sorted into alphabetical order. If that is not an issue or if your student would rather write, decide how you want to break up the alphabet—maybe two pages for A-C, D-F, etc. Notebook dividers or tabbed cardstock can be used to separate sections. As your student completes his daily reading for this unit, have him keep an ongoing list of medieval terms and their definitions. There will be other words throughout the book and other reading selections for the Middle Ages unit that could also be included in your student’s dictionary. learn a little calligraphy and create a title page similar to the one in the illustration above. After all the words have been added to the dictionary, it is time to make the cover! If you are choosing the the simple approach but want to have some kind of a cover, just use a 1/2 inch 3 ringed view binder and have your student decorate the cover insert with a drawing or computer clip art. Search for more clip art by using other terms such as knight, castle, monastery and medieval. Fold the contact paper in half loosely (before removing the backing!) to find the middle. Open the paper again and lay it out lengthwise, with the colored/patterned side down. Place the cardboard side by side on the wrong side of the contact paper, in a portrait (not landscape) fashion, allowing about a pencil width between the the pieces of cardboard. The cardboard should have about an inch margin of contact paper above the top and about two inches on the bottom. Trim the four corners of the contact paper to make neater corners once they are folded. Remove the cardboard and carefully remove the backing of the contact paper. Lay the contact paper out as before, with the right/patterned side down, and place the two pieces of cardboard evenly, side by side on top of the sticky side of the contact paper, with a pencil-width margin between the pieces. Carefully and neatly fold the top and bottom margins of the contact paper over the cardboard. Start with the middle and work your way out to the sides.Carefully and neatly fold the side margins over the cardboard. Take the stack of dictionary papers and make sure they are in order. Line up the stack, and place it in the middle of the book, centering it top and bottom with the cardboard pieces. Make sure the left margin of the stack is in contact with the center margin of the contact paper. Close the book cover and staple at least three times down the length of the fold, making sure you are stapling all of the papers inside the book. Decorate the cover of the book by writing a title in permanent ink and adding stickers or gluing on beads/yarn, etc. Read about medieval books and look at some pictures of a few at this Metropolitan Museum here for inspiration! We hope this activity provides an enjoyable opportunity for hands on learning for you! This project is from the Middle Ages Unit contained in the Middle School Level 1 Lesson Plans. View a complete description of our Daily Lesson Plans here. Have you ever made a book with your students?